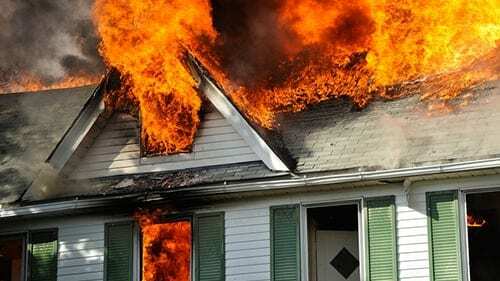 According to the National Fire Protection Association, U.S. fire departments responded to an estimated average of 358,500 home structure fires per year. The absolute key to preventing house fires is the basic knowledge of fire safety and prevention. It’s always best to be prepared for the event of a fire because it comes with dangerous and deadly consequences that may affect you and your loved ones. If you don’t already, examine your smoke detectors regularly, get a professional to service your heating system, and check out these five things that are the leading causes of house fires in America that you could easily prevent. Defective wiring and outlets are one of the top causes of house fires. Try avoiding power strips and only use them for temporary solutions. Outlets and power strips should never be overloaded with multiples devices or appliances because they can spike a circuit. Take the time to check electrical cords throughout your home and check for old, frayed, or damaged cords for immediate replacement. Keep away any hazardous items from outlets in use. Make it a habit to check your stove and oven before leaving the house. It’s better safe than sorry if someone accidently leaves a gas or electric appliance running without supervision. Always attend to pots and pans whenever in use for cooking and baking. Keep cooking oil away from the stove and remember to clean up around the stove for leftover food or grease that could potentially ignite a fire. It’s always best to keep a fire extinguisher readily available in the kitchen at all times. Remove the lint from your dryer filter after each load. A clogged filter reduces the airflow needed to work efficiently and heat builds up in the vents and forces lint onto the heating coils. Remember to check around your washer and dryer for lint or dust accumulation near power outlets. Space heaters, wood or pellet stoves, and dirty chimneys are common fire hazards that need extra precaution when in use. Never place personal heaters near fabric materials like curtains, bedding, furniture or other objects that could easily catch fire. You should also inspect your fireplace annually to get it professionally cleaned of any ashes or dirt that could catch a fire. You should never burn cardboard, paper, trash or plants in your fireplace either. Try keeping trash, firewood, pile of leaves or other debris clear of your home. If a grass or accidental fire sparks, these items could easily ignite and spread quickly around or in your home. You should never dump hot ashes inside or near your home. Instead, keep them in a metal container away from your house.